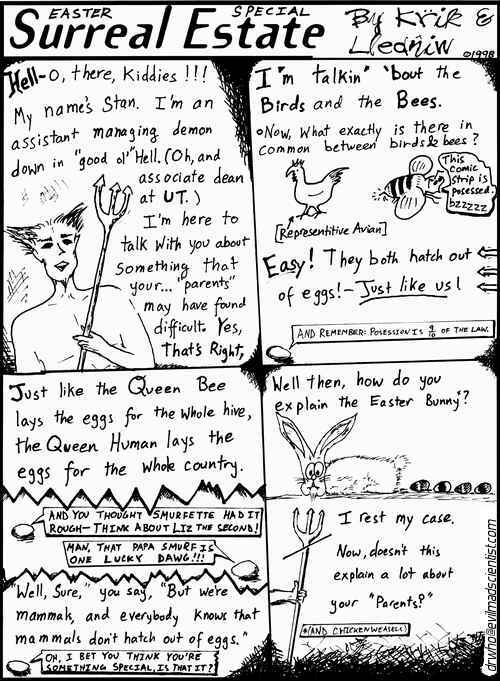 From 1997-1999, I was a cartoonist on both the comics and editorial pages for the Daily Texan, the student newspaper of the University of Texas at Austin. The Deadly Toxin, as it was widely known, was a fairly “big” paper with a daily circuation (on weekdays) of around 25,000 copies. I wrote the cartoon off and on with the help of Kirk Madison, hence the byline “Krik and Lledniw.” The cartoons were published under three titles, “Surreal Estate,” “Fire Andy Smith,” and “Unit Normal.” They ranged from very, very silly (like this one) to pointed editorial cartoons that even once earned me a concerned letter from the president of the university– but that’s another story. We are slowly working on getting the archives online. But here’s a teaser: the cartoon above was the Easter special in 1998. This entry was posted in EMSL Projects and tagged easter, humor. Bookmark the Permalink. I remember your stuff from when I was at UT. I was there as a grad student from ’97 to ’01. Wow I’ve been looking at this site all day and am obsessed! And then I read you went to UT. I’m a sophomore there and have a best friend who works on the Daily Texan. Small world!